Of the million stories in my end of the art business, most can’t be told if I want to stay in business. Those books of mine that aspire to attain the level of what Harriet Klausner terms the “sub-genre” Art Mystery, have to be fiction. The art business, on the other hand, should be based in reality. However, in the art business, as in fiction, a good story can encourage cash. A couple of stories that I can tell, from my experience in the art business, are germane to how I started to write fiction. and the present) achieved significance in the outside world. As a very young man I’d organized the first major exhibition of his works since the year of his death in 1939. The fallout of this long preoccupation is my present role as editor of the Catalogue Raisonné of his works, which I hope to publish within the next five years. It is a difficult task, requiring the same suppression of invention as does accounting. Because of this role, I have become the “expert” for this particular painter, even to the point of being called to testify in court concerning issues of authenticity. While I was doing other business in my gallery, people dropped in unexpectedly. Sometimes what they presented required me to learn new things fast. One morning a man pulled up in his car and asked if I could look at some paintings and tell him if they were worth anything. The man was as ignorant of my business as I was of his. He was a contractor specializing in the operation of heavy machinery. I would have been as good at digging the foundation for the new high school as he was at recognizing what a painting was. The collection he brought in included the paint-by-numbers lighthouse on a tile; the pink pony in a ballet skirt; a bowl of oranges with a banana next to it, on canvas board, thinly painted and gruesome, and graded on the back in magic marker, “Late. C+”. It was all junk, and none of it older than 1965 except for one really arresting exception: a large painting of pineapples in a field, at all stages of growth, done probably in the late 1800s, I thought, and with a definite signature concealed in the shrubbery, although I couldn’t read it because on its own it was already hard to read, and in addition this painting was filthy. Also it had a terrible new rip in it. The owner started apologizing for it, ashamed he’d even brought it into my clean gallery. Unlike the rest of the collection, this painting must have value, I told him. “Rats,” he said, or words to that effect. “Too bad I carried it home on the luggage rack.” Like everything else he had, he’d bought the picture at a yard sale for a few bucks. The painting had been blown off the car and damaged before he realized he ought to tie it down. The painting looked European. At the same time, the subject was New World. My first association with the pineapples was with the Dole Company, and with Hawaii. My client wanted to sell, in fact had hoped to sell the picture to me that morning, for whatever I might offer that gave him a profit over what he’d spent. I persuaded him rather than press for a quick price we were both too ignorant to decide fairly, to wait while I did some research. He left the painting with me with a handshake and a mutual agreement that I’d figure the thing out, get it repaired, sell it for him, and we’d divide the proceeds at an agreed percentage. Once I’d had the picture cleaned, the conservator and I made out the signature of Francisco Oller (1833-1917). Now I had a commercial excuse to do one of the things I love—burrow around in the library and find out things I’d never dreamed of, about worthy painters I’ve never heard of. Oller turned out to be one of Puerto Rico’s earliest and most notable painters. He had studied in Paris (I was right about the European look), and had been a friend of Cézanne’s. He had left a large body of interesting work, now in private collections, or in museums. There was a market for his paintings, which were not readily available. This was an ideal situation for the seller, my client. I established what the art business calls an “aggressive” price, and finally made the sale to a collector in San Juan, a dealer in glass and china, through the curator of a museum, who drove me across the island after the sale had been made, to visit his remarkable Museo de Arte of Ponce. If I had put the painting up for the sale at auction via a Latin American sale at Christie’s New York, for example, the same collector would likely have been the purchaser—but at a lower price than he in fact paid me, since his chief competitor would not been as ambitious as he was, and prices realized are based on competition. It was better for us that the buyer compete with my intractable price, and with me, representing the invisible owner. Every one of the characters introduced to me, however fleetingly, during the course of this transaction, was fascinating: the painter, Oller; my client the contractor, who was pleased but unsurprised by the payment of many thousands of dollars I delivered to him; the dealer in china and glass; the curator through whom I had reached the collector; and perhaps most of all the man whose acquisitions had been the basis of the Ponce museum. His fortune had come from the cement business. The collection made no distinction between the grotesque and the sublime. After the sale, I was left with unsatisfied curiosity about the painting. I don’t think the way an art historian does, or a connoisseur (whatever that is), in that I don’t ask myself what brought to the painter’s mind and canvas, the subject, as if it were a still-life, of living pineapples in the wild? Because I make paintings, exhibit them, even sell them to people; the question where they come from does not seem relevant. Would you ask the bus driver, “How did you get the idea of driving from Boston to New York?” There are painters who speak romantically and passionately about their work. But I don’t trust them. If I were prettier (and if they seemed to be paying attention to me at all) I’d think they were trying to get me into bed. When painters talk to each other, in my experience, they discuss solvents. No, when I think about Oller’s picture of pineapples, I wonder, how did it get from Puerto Rico to a Boston suburb? Where was it during the century between when it was made and when it blew off the contractor’s luggage rack? How did it get from being understood and honored, to sitting under a card table on an overgrown lawn next to a pair of used skis and an ice cream-making machine? When I came to start writing the mystery series, it was this kind of that curiosity that I indulged in fiction. The experience with Oller preceded my first sustained writing in the field of art, which was a painter’s biography. I had bought (for $350), at a country auction north of Boston, a small 1892 pointillist painting of Venice, dedicated to a “Miss Gill,” and signed only with a monogram that meant nothing to me, but which ultimately could be deciphered as TM. Almost simultaneously a friend of mine, the writer Guy Davenport, of Lexington, Kentucky, introduced me to the son of the photographer Ralph Eugene Meatyard, who put me in touch with a cousin, the son of the American painter Thomas Buford Meteyard (1865–1928). (The painter spelled his name in the English fashion.) The son, who had inherited his father’s paintings, lived not far from London. My TM, happily, proved to be this same Thomas Buford Meteyard, at one time of Scituate, Massachusetts. He, as a young man in 1893, had painted haystacks in Giverny next to Monet. (Miss Gill turned out to be Mariquita Gill, also a painter). I went to meet the son, became agent for the estate, and brought it to the market via colleagues in the New York Gallery, Berry-Hill, who published my biography as a part of the exhibition catalogue. Meteyard knew everyone in Boston and Paris and London in the 1890s. His was a good story, and his paintings are good. For me that made, and makes, the story much, much better. Though I trespass on the territory, I don’t claim to be an art historian. That’s a profession, like accountant, for which a person needs a qualifying degree from a recognized institution. I don’t have the patience, which to me looks like three quarters of the skill necessary, for either an accountant or an art historian. After the Meteyard biography, and during a time when the art market went flat, I started making things up, and the first book in my series, Harmony in Flesh and Black, was published in 1995. There’s been a new book every couple of years or so and I am working on the sixth now, Madonna of the Apes. These books are genuinely fiction, even though what we call invention is always a combination of what we’ve experienced. I like to speculate on the nature and histories of real works that have disappeared, by real painters who have died. I like to drop those works into today’s market. Painters always. I can’t get anywhere with sculpture. Both the accounts I began this essay with, concerning Meteyard and Oller, include a satisfying element of commercial success. I was able to transfer to the contractor, after I sold his Oller, a number of thousands of dollars that I don’t specify because that part of the story, like his name, I keep in confidence. I made money too. I don’t say how much because that makes it seem like more. The Meteyard adventure led to a continuing project that, beginning in 1984, has led most recently to my organization of the exhibition Thomas Buford Meteyard: Un Américain chez les Nabis, at the Musée d’Art Américain, Giverny, France, during the summer of 2004. I own paintings by Meteyard, and sometimes sell one (for more than the $350 my first one cost). sexual/religious, about famous dead people. Some books that seem to be about art are really only about treasure—any old treasure—and not really about art. It just happens to be that what motivates the struggle driving the story is a coagulation of portable wealth in the form of a painting. For me the painting should be interesting in itself, even if it’s imaginary; and so it needs to be imagined very substantially if it is going to hold my interest. Money does interest me, but not enough to motivate a book. What makes a person buy a work of art? While I may have a line on the value of a work by a dead painter, I don’t understand the market for living painters. I am always amazed and gratified when a stranger exchanges good money for a painting I have made. To me that’s the mystery. Art functions as a kind of currency, though it’s unregulated; and many art transactions require a spiritual contribution, on the part of the buyer, that may be matched best by the artist’s initiating spiritual effort. When the work of art is made, it is normally (in financial terms) worthless. It is other humans, in their multiple transactions, through their cumulative good will, who add financial value to a work of art. My principal protagonists, the collector Clayton Reed, and Fred Taylor (whatever he is), don’t speak for me. I have yet to meet a character in a book of mine who thinks about art the way I do. Probably even I don’t think the way I do. Somewhere down the line I intend a book that satisfies my nostalgia for the academic studio, and brings back the bleak atmosphere on a Thursday afternoon in February where thirty-some sophomores have spent the last six hours drawing from a naked person, smoking, dodging the hortatory insults of the instructor, and wondering why they didn’t choose to go into refrigeration. Why the naked person? You try keeping a bunch of sophomores focused for six hours. A naked person is funny, and engaging, and compelling, and can be measured. If the drawing is wrong, everyone knows it, even the student, who is a naked person also, underneath. 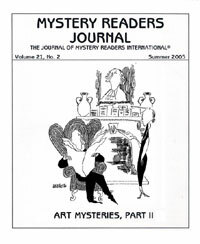 Nicholas Kilmer publishes his art mystery series with Poisoned Pen Press. He was guest curator for Frederick Carl Frieseke: The Evolution of an American Impressionist, and author of the artist’s biography included in the exhibition catalogue (Princeton University and Telfair Museum of Art, 2001). He is represented by Dennis Rosenthal Fine Art, Chicago, and by Galerie d’Art International, Solana Beach, CA.